070. THE "NIMROD." Issued by W.D. & H.O. Wills; The Imperial Tobacco Co (of Great Britain and Ireland) Ltd. (1911). Card number 3 from a set of 50 entitled "Celebrated Ships." Size: Ca. 2.68" x 1.4". Recto: View of Nimrod steaming along the Great Barrier. Upper right: WILL'S CIGARETTES. Verso: No. 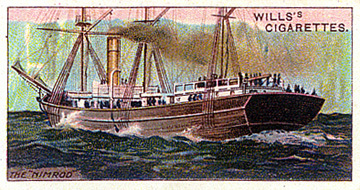 3 | CELEBRATED SHIPS | WILL'S | CIGARETTES | The "Nimrod." The gallant little Nimrod, to the good qualities of which the Shackleton Expedition (1907-9) owed so much of its success, was formerly a Newfoundland whaler. Although her burden was only 227 tons, and her maximum speed six knots, she was strongly built and bravely weathered the Antarctic gales and ice-packs. | W.D. & H.O. WILLS, | BRISTOL & LONDON. | ISSUED BY THE IMPERIAL TOBACCO CO. | OF GREAT BRITAIN & IRELAND LTD. On left margin: Albums for these pictures cards can be obtained. On right margin: at 1/- each from all tobacconists.